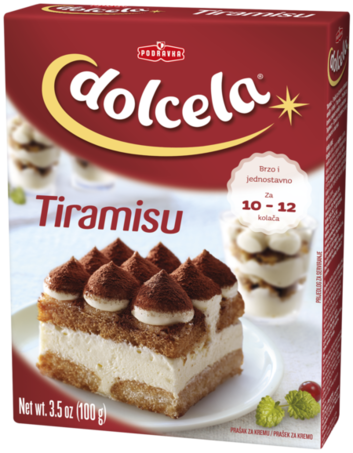 The unforgettable Tiramisu taste cannot be compared with any other taste. This tremendous Italian specialty contains skimmed milk powder, edible gelatin and milk proteins. The popular Tiramisu cream may be used as a filling for crepes, rolls, cakes. Added natural colours beta-carotene and paprika extract. Empty the bag contents in 3 dl of cold milk and stir. Mix with an electric mixer (medium speed) for 4-5 minutes. Immediately apply the cream on the cake surface or piskote biscuits soaked in a mixture of coffee and Amaretto or rum, sprinkle with cocoa powder, put about... show more Empty the bag contents in 3 dl of cold milk and stir. Mix with an electric mixer (medium speed) for 4-5 minutes. Immediately apply the cream on the cake surface or piskote biscuits soaked in a mixture of coffee and Amaretto or rum, sprinkle with cocoa powder, put about 2 hours in the refrigerator and serve as Tiramisu slices. Ingredients: sugar, skimmed milk powder, modified starch, hydrogenated vegetable fat (coconut, palm), edible gelatin (beef), glucose syrup, emulsifier (E 472a), milk proteins, colour (beta-carotene, paprika extract), flavour. May contain wheat and eggs.